An MSP has called for the trial of a new flight path from Edinburgh Airport to be halted saying the community was not consulted on the plan. Labour MSP Neil Findlay said there was “widespread concern” from communities in the trial flight path, which now has planes travelling over West Lothian. He said residents were experiencing sleep disruption and noise pollution. He added: “It was always our intention, and it remains so, that in the event the route is technically viable – and it is important to establish that through the trial process – we will undertake a full and thorough consultation with local communities and affected stakeholders. The Labour MSP called for the airport’s management to halt the trial and to carry out a full consultation with all of the communities affected. The trial, which started on 25 June, is due to end on 24 December. There are three existing flight routes to the west but Edinburgh Airport launched the six-month trial to establish if it could increase its take-off capacity by cutting the departure interval between flights from two minutes to one. Scottish Green MSP Alison Johnstone said there was no advance notice of the trial flight path. It shows the universal criticism from MSPs about lack of consultation on the introduction of the trial, and the MSPs highlighting the similarities of what happened at Gatwick and London City Airport, all airports being owned by the same company, GIP. The proposer of the motion Neil Findlay (Labour) lamented, on climate change grounds, the Scottish Government’s desire to get rid of APD and the increased leisure flights that could cause. The residents in the Public Gallery were not stopped applauding the speeches they liked! THOUSANDS of residents have demanded Edinburgh Airport abandons trials of a new flight path because because of problems with noise pollution. Householders living beneath the trial route, which passes over communities including Bo’ness and Blackness and cuts between Prestonpans and Musselburgh, say they are suffering from sleep deprivation and stress as a result of low-flying aircraft passing overhead from around 5am until midnight. Some of the planes are also flying into Edinburgh Airport during the night at times including 2.30am. The six-month trial, which launched in June, is aimed at reducing congestion at Scotland’s busiest airport by offering aircraft an alternative flightpath to and from the hub and reducing delays for passengers. [That amounts to making more money for the airport and the airlines, from cost savings]. It is scheduled to end on Christmas Eve, but there are now calls for it to be cut short. Alison Johnstone, Green MSP for the Lothians, said some of her constituents had been “reduced to tears” by noise and lack of sleep since it began, and criticised the airport and its owners, Global Infrastructure Partners, for not doing more to consult with the public prior to the launch. Transport Minister Derek Mackay told parliament he will write to Edinburgh Airport to ask them to consider ending the flight path trial early, if they have have enough data to carry out a full evaluation of the trial. The trial is supported by air traffic controller, NATS, and is in line with Civil Aviation Authority guidelines which do not require UK airports to undertake a full public consultation prior to trialling a new flightpath. Airspace regulation is reserved to Westminster. Edinburgh Airport contacted local community councils, councillors and MSPs to make them aware of the plans in advance. However, Neil Findlay, the Labour MSP for Lothian who is spearheading calls for the Edinburgh flightpath trial to be suspended, said airport bosses had “completely disregarded” the potential impact on local communities. He said: “The decision to have no public consultation is frankly a disgrace, more of a disgrace however is that the CAA rules allow them not to consult with the people living below. Likewise the trial appears completely unconcerned about the wider environment and the impact that there may be on our climate change targets. It is understood Edinburgh Airport has now received some 2,200 complaints about the trial from 600 local residents and will seek advice from the CAA about possibly shortening the trial from the recommended six months. A spokesman for Edinburgh Airport said: “We note Mr Findlay’s and the community’s concerns regarding the trial. It was always our intention, and it remains so, that in the event the route is technically viable – and it is important to establish that through the trial process – we will undertake a full and thorough consultation with local communities and affected stakeholders. “Airports and air traffic control organisations sometimes carry out short-term trials to gather data and validate possible proposals for future requests for changes to the UK airspace structure. This means that for a short period aircraft may be flying different routes. “We absolutely understand that aircraft noise disturbs people, but any trial will have a fixed start and end date and if, after the trial, the organisation running it wishes to make the change permanent then the full airspace change process, including consultation, will be required. THE Scottish Government is to ask Edinburgh Airport to cut short its controversial flight path trial. Transport Minister Derek Mackay will write to the airport asking it to truncate the six-month trial so residents badly affected by noise will not have to suffer the effects until Christmas Eve, as currently planned. Speaking during yesterday’s Holyrood debate on the new flight path over West Lothian, Mr Mackay also said the lack of consultation by the airport, while permitted by Civil Aviation Authority regulations, had not been acceptable. While he praised the airport’s economic success, he said: “I say of course there should be such consultation. Edinburgh Airport’s own briefing states, ‘We understand that noise can have a detrimental impact and this trial is an imposition on people who did not buy a house under a flight path’. 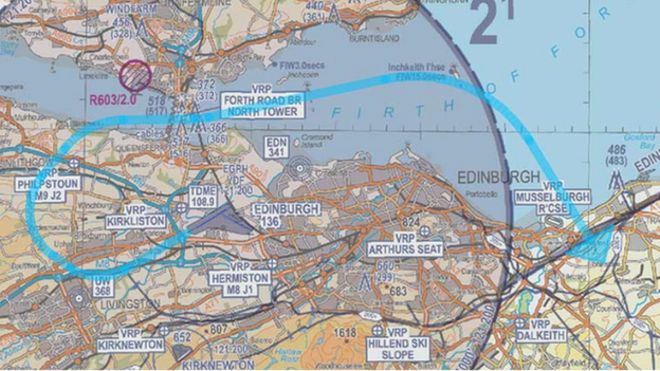 Lothian’s Conservative MSP Gavin Brown said there was no “legal or regulatory requirement” to trial the new flight path for the full six months. The trial, which sees planes take off every minute at early morning peak times and fly west over Broxburn, Uphall, Dechmont and Linlithgow, has provoked outrage among residents. Campaigners of SEAT (Stop Edinburgh Airspace Trial) launched a petition against the trial and have won the support of cross-party Lothian MSPs, including Labour’s Neil Findlay who yesterday led the debate. He said: “The CAA guidance says there’s no need to consult – it’s completely unacceptable they don’t see the need to engage with the public and that [airport owner] Global Investment Partners fails to recognise its obligations to the community.” [GIP also owns Gatwick Airport, where there has been a huge outcry about flight path trials and flight path changes, and London City Airport]. Mr Findlay, along with Green MSP Alison Johnstone, questioned the business case for a new flight path, and suggested the move was part of GIP’s plan to “fatten up” the airport for sale. Posted: Friday, September 11th, 2015. Filed in News about Airports, Noise News, Recent News.